How do you save money on printer ink? Discussion in Office Supplies started by True2marie • May 18, 2014. A major expense for me in regards to my computer is printer ink. I try to find deals and other ways to save money, but it just seems as though I always end up paying around $40. Have any of you figured out a way to spend less on this item? If so, please share. Really the best way that I have found to save money on printing is to spend money on a laser printer and to get rid of the ink jet. If you must print color on occasion, it is worth having an ink jet available but most of us just print in black and white so a laser printer does a great job. I was spending well over $150 per year on cartridges for my ink jet and had the three colour blend so one color would run out and a new one was needed. When I bought my laser printer (6 years ago?) I picked up an extra toner cartridge and only recently installed it. The printer has paid for itself by basically saving me on ink. I really consider carefully before I decide to print anything. If I can do away with printing, I would. Inks are very expensive and you would not want to be using it for things that you won't even spend a few minutes to read. If I have to print, I would always set it on draft printing as well, unless it's an extremely important document. This would definitely prolong the life of my ink cartridge. I use to do refills, but I've read that they could actually damage the printer in a long run use, so I just buy. And for me to save, if there's a promo that I would be able to save if I bought in bulks, then I buy in bulks. Or if there is a coupon I can use, then I use it. Whatever way I am imposed to save, I grab it as long as I can. I am a technician, so here are a couple of tips that most people don't know. The first one is to be skeptical of low-cartridge warnings. Warnings that a given color cartridge is running low and needs to be replaced often start well before the ink level is actually a problem. The accuracy of such warnings can vary greatly between printer brands and models, and you don't want to waste ink and money by replacing the cartridges too soon. In time you'll learn whether your printer's warnings are dire or premature. Until then, don't rush to replace a cartridge, unless you notice degradation in the output quality or if you are starting a large and vital print job. With laser printers, toner will settle over time, causing it to be unevenly distributed on the printed page, causing faded areas and/or streaking. If your laser print quality is deteriorating, remove the toner cartridge from the printer and shake or rock it from side to side five or six times. You may be able to do this several times before the cartridge actually needs replacing. Hope these tips help to save you some money! I always have my printing jobs done in the printing shop. This is economical for my use since I hardly even have to print in a week. The kids are homeschooled so I have their work sheets printed by bulk and the shop I go to uses 'tanked' inks that are so commonplace here were I live. They charge a reasonable amount for the printing jobs and saves me the hassle fo having to maintain my very own printer. I did own a couple of printers and as I computed by expense in maintaining them, I decided to never bother owning one. I have an older printer, so refills are $10. If I bought a newer printer, the refills would be $40, so I stick with my printer from 2004. When it comes to printing documents and coupons, it doesn't make a difference that the printer is old. If I have to print photos, I put them on a disc or flash drive and print them at Walmart's camera section. I actually found out that remanufactured ink is VERY cheap, and it actually almost lasts as long as the full price! I bought a pack of 9 Black, and 3 of each color cartridge for only $17. The first black cartridge has lasted me about 100 sheets, and looks completely normal. I would definitely look into buying some of this type of ink, because you will not find a better deal anywhere. Recently there have been new ways of getting fake ink and I just go for those. There is a new method wherein the cartridges are actually placed outside of the printer because they are huge and there are just tubes that direct the ink into the actual nozzles. I think this is the most practical way to go about it but it takes an initial fee and time to get it setup. After that it doesn't cost much anymore to get the refills though and another good thing about it is that since the cartridges are enlarged you don't even have to go back and buy refills as often. I have a Lexmark and the ink is incredibly expensive. So I would go a long time before buying new ink cartridges as I don't really print that much. Just recently, I had to buy some so I decided to find some on eBay and I found some for cheap. I got two of each cartridge for a little over $20 with free shipping. They are not Lexmark brand but they have worked just fine and I have had no problem with the way they are printing. I will definitely by from that supplier again when I run out. That was the cheapest that I found so far. I had to buy a printer a few years ago so that I was able to print photographs off on photo paper and this is especially expensive, but necessary for a photographer to be able to print things. I made sure to do my homework on what ink would work out the cheapest after I'd bought the printer and I'm sure this does help with keeping costs down but I print so much that I think it would be expensive regardless of what brand I had. I usually buy my photo paper in dollar store type stores, so at least I don't have to spend so much on the paper I'm using, but I find the ink is always quite expensive and I go through a lot of it as well. I try to always make sure I've got the paper properly lined up and check the ink levels before I print so I avoid wasting any ink that way but I still find I need new cartridges at least every couple of months. I used to refill my cartridges when I had my old printer but with this one I've not been able to do that because of the type of cartridges which is unfortunate as that used to save me quite a bit of money though. The ink pots were a lot cheaper than the cartridges. In our office, a smart guy made a computations on how we can save on printer ink. 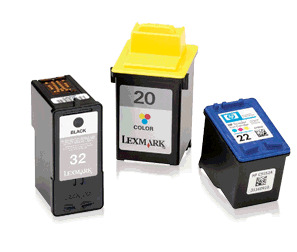 Most of the printers shifted to the refillable cartridge, they were issued 2 cartridges, i.e. one for black and another for colored ink. We normally use black only so that saves us a lot from buying colored ink and we also save on colored ink since it is refillable. However, when the print were not that good, we shifted back to the unrefillable cartridge for the colored although we retained the refillable black cartridge. I would only buy my ink if there is a sale (unless I really needed it asap). I would take advantage of the store loyalty cards. One good deal is turning in your old ink for store credit. Then I would wait until I get the special coupons like spend $50 get $10 off. So when I combine these deals I end up saving quite a bit of money on ink. I bought an Epson printer model with built-in continuous ink system. The print quality is just great and the ink refills are quite cheap. It has 4 ink tanks and I only buy whatever color is near deficient level. We buy the ink along with other office supplies purchases from a supplier who is selling them at wholesale prices which are still way cheaper than bookstore sale prices. I order my personal office/school supplies from the supplier that delivers to my office so I get the same discounted prices. I have noticed that printer cartridges cost a lot low if you buy them during the black friday. I usually buy 4 months of supply during that time. I avoid printing things that I can get rid of with the PDF file. So that is my way of saving the money on both printer and the paper. It's hard to avoid not to print stuff but it's definitely possible. I hate printers and found that they never lasted very long but the one I have now is better. I've had it 2 years without a problem .. an HP Envy 4500. Although the ink is expensive I am so grateful this one hasn't gone wrong that I buy it without question. I have found some cheaper deals online so usually buy it this way. One thing I notice is if I don't use my printer for a while the ink seems to dry up a little so I will use it at least once a month to keep it going. You cannot save money on this, the only way is to avoid printing but this is impossible. I heard from one of my friends that he introduce n the ink bottle some water with a syringe, I don't know how he can do this because the risk to break the print. It is hard to save money when it comes to things like printer ink but it is still possible. I would try to shop at stores that are well known for bringing up deals. Maybe try to stock up on printer ever beginning of fall, that is when school usually starts and most school supplies are on sale.